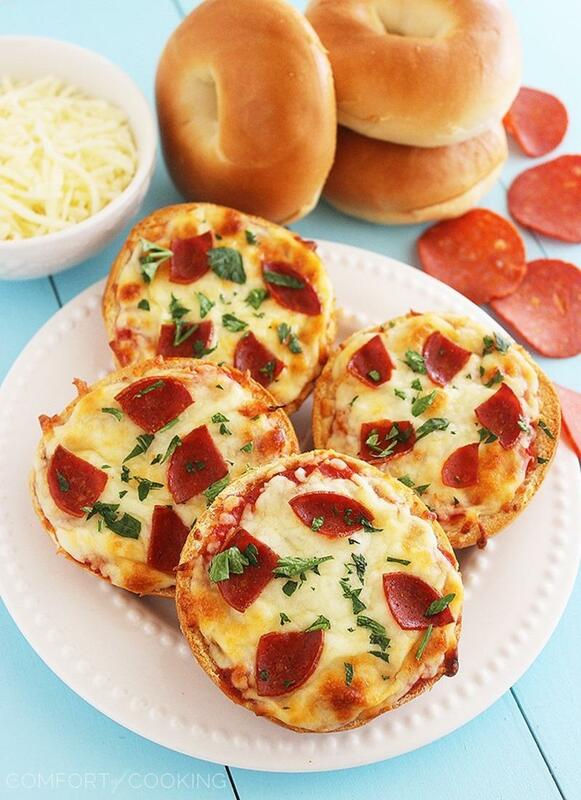 Crispy, cheesy pizzas on top of mini bagels, piled with your favorite toppings and baked to golden brown perfection! 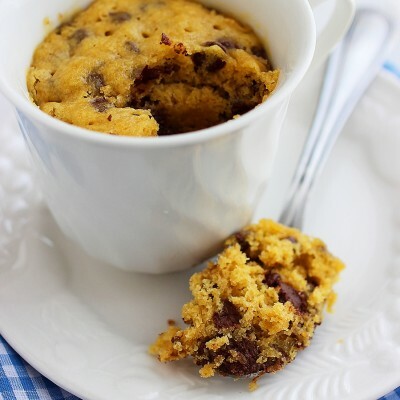 These little bites are super fun for parties and busy weeknights that call for quick & easy! 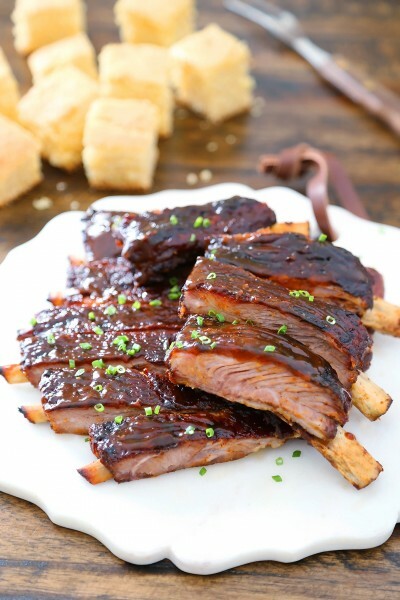 If there’s one thing I’ve learned about entertaining, it’s that easy does it when it comes to the food…. especially when guys are involved! I cooked a big batch of these mini bagel pizzas for hubby’s poker night last weekend, and wouldn’t ya know it, the simplest recipe (among a sizable spread) flew off the platter! They couldn’t keep their card-playing paws off these cheesy, gooey bites of pizza goodness. I’ve made mini pizzas on top of homemade dough, sandwich thins, and zucchini slices, but you just can’t beat it on top of a toasty hot bagel. The short time it takes to make and bake these delicious mini pizzas yields insta-satisfaction for your pizza cravings. And who wants to wait more time than absolutely necessary to enjoy pizza? Just split a bunch of mini bagels in half, spoon on your favorite pizza sauce, and top with shredded mozzarella. 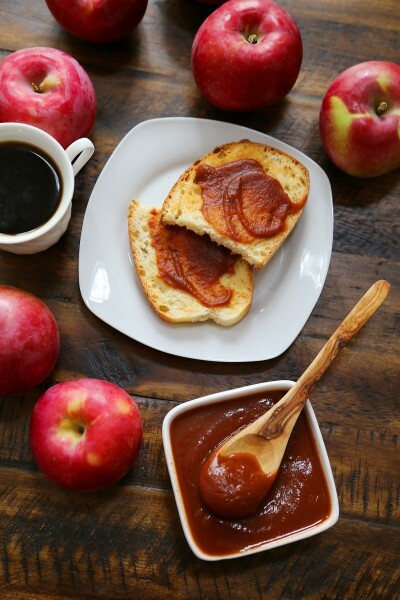 Toss on your favorite toppings (or stick with turkey pepperoni like me), and bake ‘til crisp and golden. Voila! Kids love ‘em, guys gulp ‘em down like water, and you’re left with hardly any cleanup. Everyone’s happy. 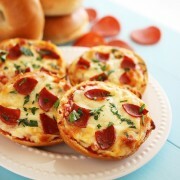 For casual parties, these mouthwatering mini bagel pizzas would be a huge hit. They were at mine! 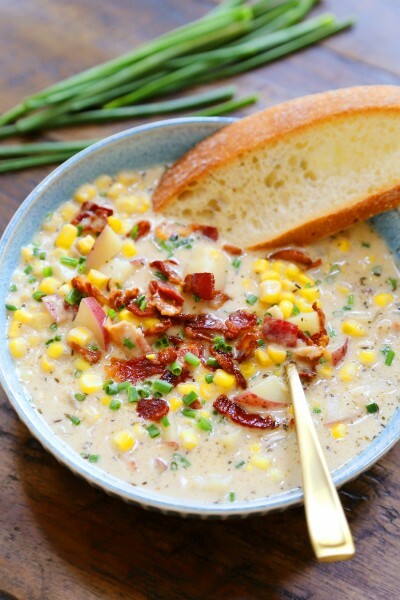 Customize them to anything you like, and get some inspiration with my long list of topping ideas below! Keep busy weeknights easy by assembling these in the morning, then pop ‘em in the oven when you get home. Scoot a fresh green salad alongside, and dinner is served! 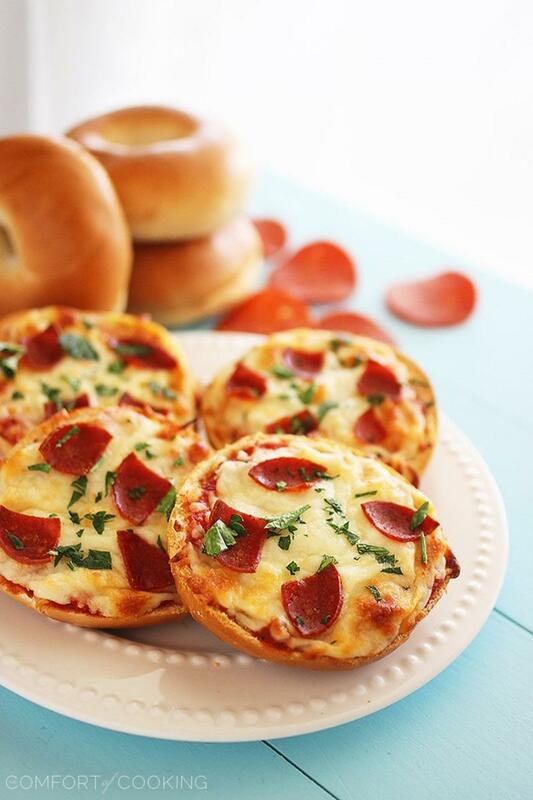 Cook up these crisp, delicious bagel pizzas tonight… and just try not to sing the jingle while you do! 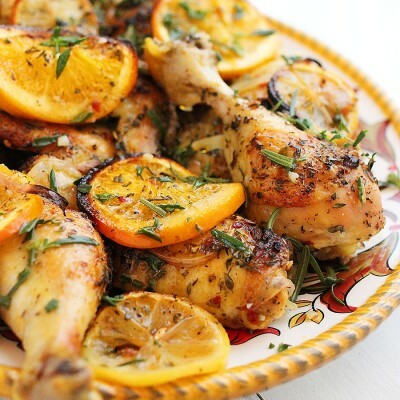 Preheat oven to 400 degrees F. Line a large baking sheet with parchment paper or nonstick aluminum foil. Place mini bagels 1 inch apart on baking sheet. 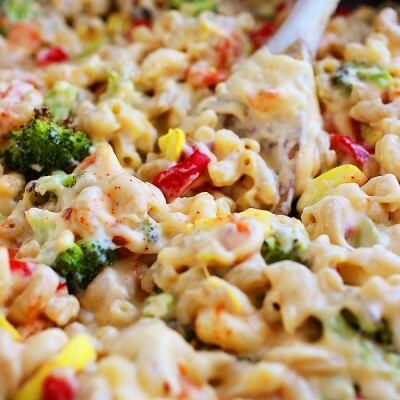 Top each with pizza sauce, cheese, and your desired toppings. 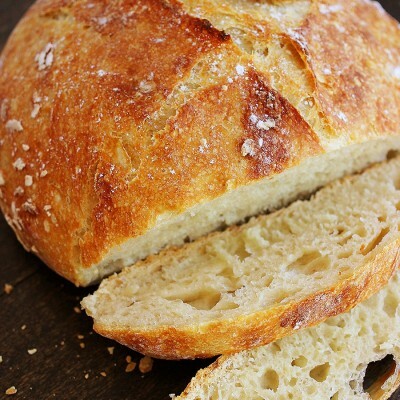 Bake for 10-12 minutes, or until bagel is crisp and cheese is golden. Serve immediately. That is such a great, simple idea :D No wonder they flew off the plate, they look fantastic! 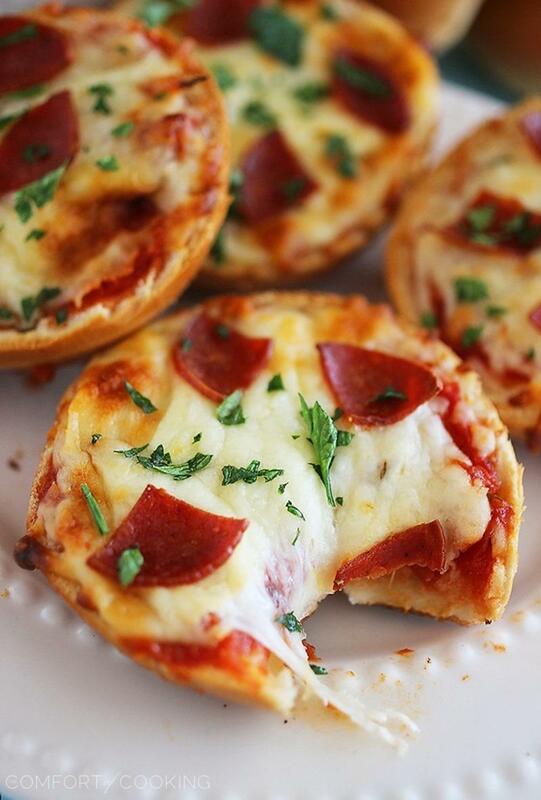 I have never thought of turning bagel into pizza :-)) These look super duper delicious! Simple is always best! I know these would go so fast with our friends too! We absolutely love making pizza bagels! So fun! The easier the recipe, the quicker I get to chow down. These look wonderful! What a great idea for entertaining! Love the versatility of it! Just to let you know – you’re going to be the best mom ever! :) Every kid in the neighborhood is going to know what’s going on it that kitchen. Love these! I could eat pizza for every meal of the day. These are adorable. These look amazing, your right, I have made complicated food entertaining, and it never works. My boyfriend used to live off these! But from the frozen food section. I think I would way rather have these. And so easy too! Brilliant! You are so right…the most casual and tasty treats are gone first! At parties, my ham and cheese rolls are the first to go. Men and kids…they love treats like this! Who doesn’t love pizza? Thanks for sharing, Georgia. Pinning! One of my all time favorites. 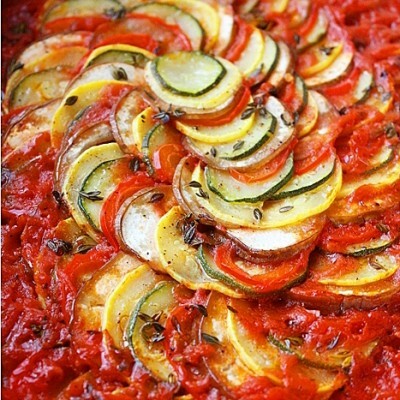 Easy and good and perfect portion control! Thank you for sharing, sweet Georgia. I hope I can see you soon! 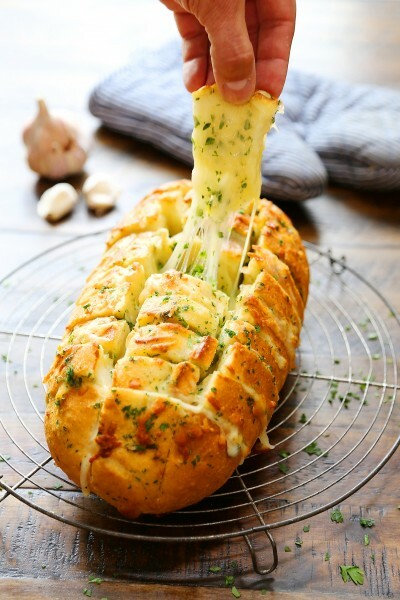 It’s hard to resist cheese and carbs, especially when the combo looks this good! 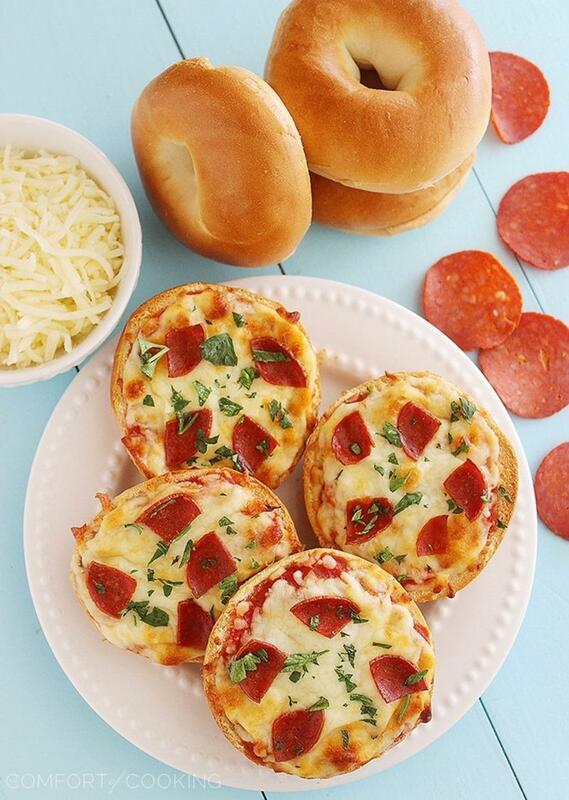 You’ll be a popular mom serving these mini bagel pizzas in school, parties, and home! Great idea, and I know this will be a great lunch menu on kids’ minimum day! How fun is this?! 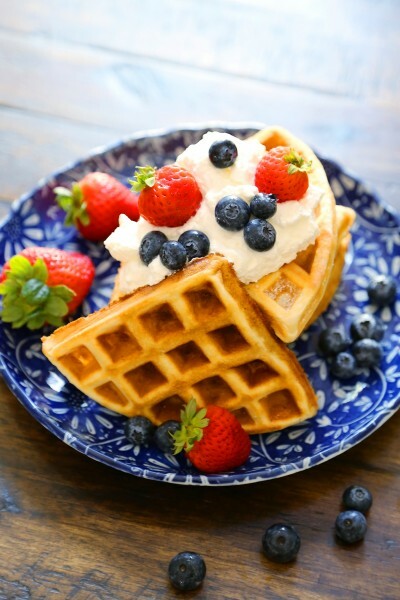 I could seriously have this for breakfast, lunch, dinner and a midnight snack! What a fantastic idea Georgia! As if bagels weren’t already great enough, you go and top them with cheese. Ohh girl, you’re my heroin! 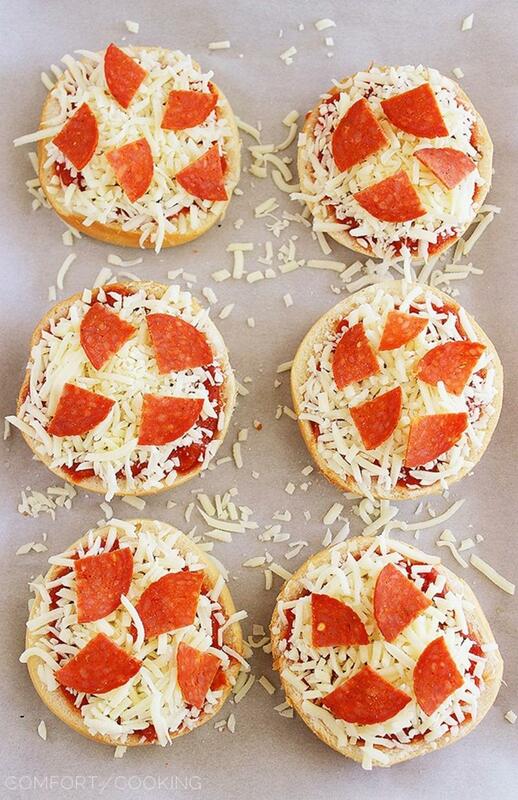 I used to love making mini pizzas when I was a kid. This brings back some good memories, and is making me want to whip up a batch soon! You are certainly correct… kids do love these (big kids too). My kids would inhale them and want more. :) They look a million times better than those hockey puck frozen kind you can find in the store. I assume you mean pizza sauce? A teaspoon of sauce on each is fine. These look awesome! I just did a throwback Back To School theme party (and blog post) with Runway Chef and Coffee & Chocolate. We definitely could have used these in our spread! !